Over few decades, one of the outstanding achievements of physics has been the isolation and identification of the four forces that rule the universe. All of them can be described in the language of fields introduced by Faraday. Unfortunately, however, none of them has quite the properties of the force fields described in most science fiction. 1. Gravity: the silent force that keeps our feet on the ground, prevents the Earth and the stars from disintegrating, and holds the solar system and galaxy together. Without gravity, we would be flung off the Earth into space at the rate of 1,000 miles per hour by the spinning planet. The problem is that gravity has precisely the opposite properties of a force field found in science fiction. Gravity is attractive, not repul sive; is extremely weak, relatively speaking; and works over enormous, astronomical distances. In other words, it is almost the opposite of the flat, thin, impenetrable barrier that one reads about in science fiction or one sees in science fiction movies. For example, it takes the entire planet Earth to attract a feather to the floor, but we can counteract Earth’s gravity by lifting the feather with a finger. The action of our finger can counteract the gravity of an entire planet that weighs over six trillion trillion kilograms. 2. Electromagnetism (EM): the force that lights up our cities. Lasers, radio, TV, modern electronics, computers, the Internet, electricity, magnetism-all are consequences of the electromagnetic force. It is perhaps the most useful force ever harnessed by humans. Unlike gravity, it can be both attractive and repulsive. However, there are several reasons that it is unsuitable as a force field. First, it can be easily neutralized. Plastics and other insulators, for example, can easily penetrate a powerful electric or magnetic field. A piece of plastic thrown in a magnetic field would pass right through. Second, electromagnetism acts over large distances and cannot easily be focused onto a plane. The laws of the EM force are described by James Clerk Maxwell’s equations, and these equations do not seem to admit force fields as solutions. 3 & 4. 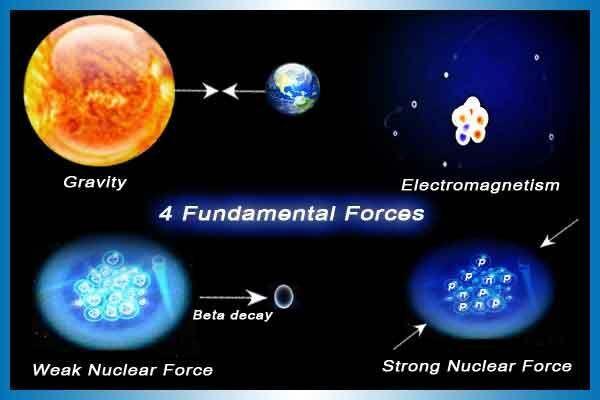 The weak and strong nuclear forces: The weak force is the force of radioactive decay. It is the force that heats up the center of the Earth, which is radioactive. It is the force behind volcanoes, earthquakes, and continental drift. The strong force holds the nucleus of the atom together. The energy of the sun and the stars originates from the nuclear force, which is responsible for lighting up the universe. The problem is that the nuclear force is a short range force, acting mainly over the distance of a nucleus. Because it is so bound to the properties of nuclei, it is extremely hard to manipulate. At present the only ways we have of manipulating this force are to blow subatomic particles apart in atom smashers or to detonate atomic bombs. Second, it may be possible to use a plasma to mimic some of the properties of a force field. A plasma is the “fourth state of matter.” Solids, liquids, and gases make up the three familiar states of matter, but the most common form of matter in the universe is plasma, a gas of ionized atoms. Because the atoms of a plasma are ripped apart, with electrons torn off the atom, the atoms are electrically charged and can be easily manipulated by electric and magnetic fields. Plasmas are the most plentiful form of visible matter in the universe, making up the sun, the stars, and interstellar gas. Plasmas are not familiar to us because they are only rarely found on the Earth, but we can see them in the form of lightning bolts, the sun, and the interior of your plasma TV.